Shark Diving in the Bahamas and Bimini! Aboard the Liveaboard Dive vessel DOLPHIN DREAM . 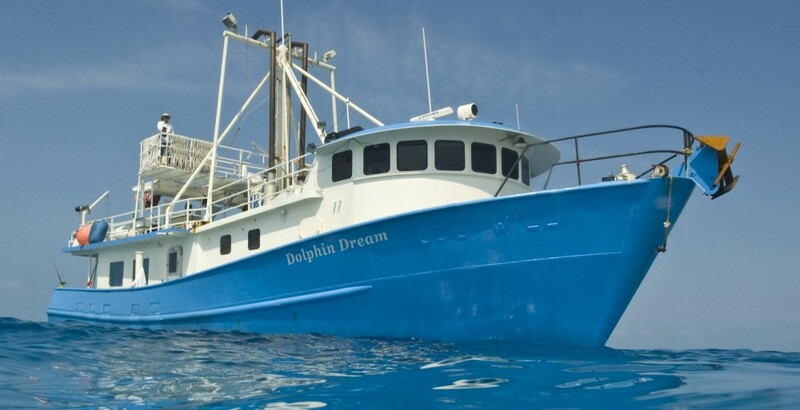 The "Dolphin Dream" is USA flag, 86' x 26' ocean expedition trawler yacht. She is designed to ride the sea in comfort, safety and style. She rolls and pitches even less than boats much bigger! Captain Scott's 25 years of live aboard diving experience went into redesigning her for the conversion to a SCUBA diving boat in 2004. Since then she has been completely rebuilt from stem to stern and is in top notch condition to ensure very few mechanical problems. She is stocked full of spare part and tools so even the occasional mechanical problem can usually be repaired with out any interruptions. The "Dolphin Dream" is not a fleet boat, she is owner operated by Captain Scott, making a big difference in condition of boat and level of service. Captain Scott spends more time at sea on the boat than he does on land, making it truly his home. He always wants it to be clean, running good and have good food onboard! As a USA flag vessel the "Dolphin Dream" is built and equipped well above any safety standards for the size vessel. She and her US crew are held to the highest USA standards, above and beyond many non-USA vessels. She has twin engines, twin generators, twin air compressors, fully air condition, safety chase boat, and all the other equipment to make your life on board comfortable and safe. There are five spacious cabins with full size upper and lower bunk beds and one large cabin with a double bed, for a maximum of 12 clients. The interior salon is located on the main deck making comfortable and safe from bad weather. The cabins are located aft of center line and down low, the most comfortable place in a boat. The salon has four benches and four chairs surrounding two tables for dining. The galley and salon are separated by a serving counter. There is a drink bar with a refrigerator, ice maker, coffee pots and a sink. There is room for cameras on shelves with electric and below the benches. There is a 27” TV, DVD, stereo, book and video library. Two spacious heads with showers, an outside shower and plenty of freshwater. The vessel is manned a captain, 2-3 deck diving crew and a cook, all trained to give the safest and funnest service. Safety is our number one priority, particularly when your in the water. At all times there are two crew on the boat watching, in case anybody has a problem while snorkeling and scuba diving. There is always at least one crew in the water with you while snorkeling and scuba diving. Why The Dolphin Dream Team? Owner operated vessel, with over 35 years experience. USA vessel, USA crew, highest standards, best food, best freshwater. Stable, comfortable, clean, easy and safe boat. Interior salon for meals, socializing, camera and computers. Departs from Florida USA, includes transportation to and from the Bahamas. Captain Scott Smith, Houston Brown, deck crew, David Finch, deck crew, Cory Cumberland and Gale Garland as cooks. Scott and the Dream Team have played host to visitors from around the world including feature film crews, National Geographic, The Cousteau Society, and many of the world's top underwater photographers. Scott has been featured in a on-hour documentary for Japanese television, educational videos, and the subject of books and magazines worldwide. The Dream Team, Inc. and Wayne Scott Smith - All rights reserved.